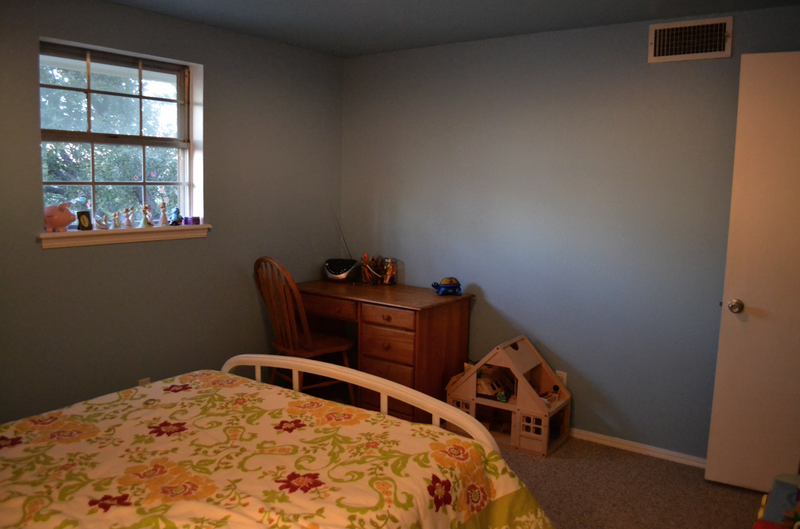 I finished painting Katie’s room today. I don’t have anything on the walls yet and no curtains, but that will all come in time. I haven’t really done curtains ANYWHERE in this house yet. I do have fabric to make curtains for two rooms, but they are both common areas downstairs. Not really sure what I’m going to do for this bedroom yet. Any ideas? In this next shot you can get a better idea of the hack-job I made of her bed. It was hunter green. it’s now murkey-streaked white. Also, the dresser in the closet used to be a weird light green with a dark green sponge-painted design. It had all the appearances of some random kid being given complete freedom to have their way with a piece of furniture. It has been restored to a respectable white again. I’m super happy with the dresser. But the bed? What was I thinking? 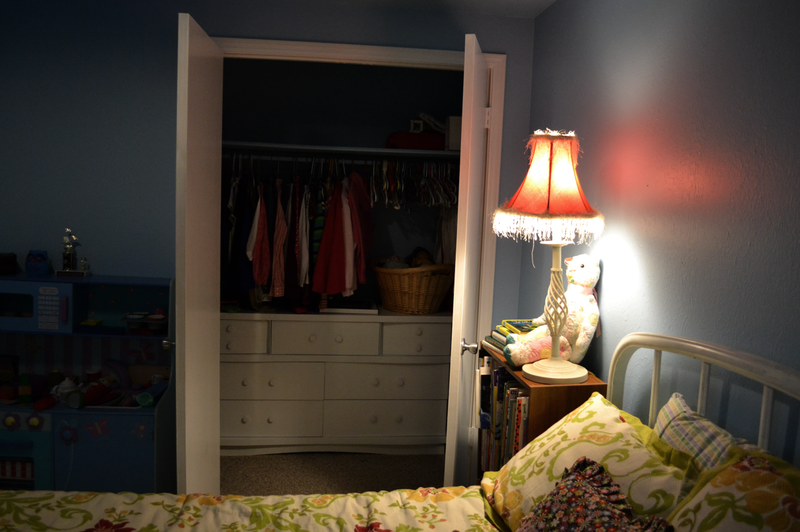 And here’s the other angle of her room. Looking pretty bare from over here. I’m taking Katie on her 10-year-old weekend city trip next weekend. We’ll be heading to Dallas and we’ll be checking out the Ikea store while we’re there. I have an idea of a couple of things that will round out this room just perfectly. 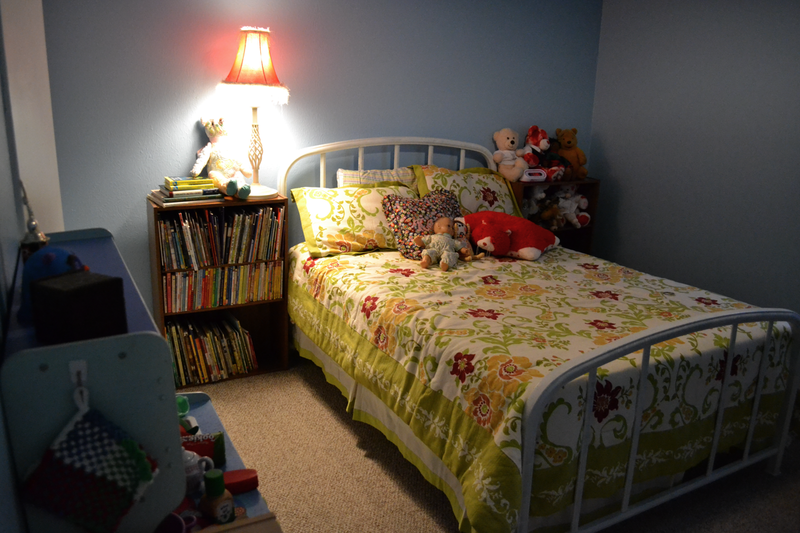 But until then, I’m pretty happy with the way it all turned out (except for the bed). K9 loves it too, bed included, so I can live with that. Love your room, Katie! Great idea for the closet! Have a wonderful time in Dallas! Did you use steel wool on the bed frame first to give the new something to stick to? Just go with the streaks and put VanGogh’s streaky, I mean Starry Night on the wall. Didn’t use steel wool… Next time… Ha! So cute- I vote cornice boards. . .